Hard outer casing surrounding a somewhat fleshy substance which seems to be sufficient in satiating appetite. When extracted correctly the remaining shell creates a useful vessel. I have identified this to be a bumpy gourd. It’s interesting that David mentions it’s sufficient to satiate an appetite, could it be Elizabeth that he was testing the food for? 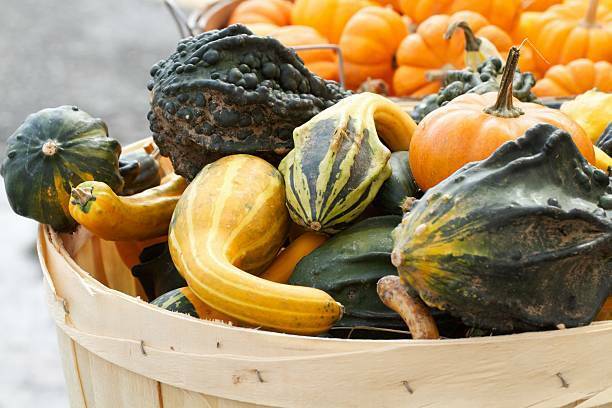 Gourds are possibly the first domesticated plant species with fossilised specimens found at archaeological sites dating from as early as 13,000 BC. They have had numerous uses throughout history, including as tools, musical instruments, objects of art, film, and food. As well as a food source this could also be a link to creation and flood mythology. 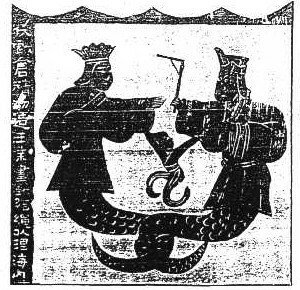 Fuxi and Nüwa, according to the Classic of Mountains and Seas were the original humans who lived on the mythological Kunlun Mountain (Huashan). One myth says they set up two separated piles of fire, and the fire eventually became one. Under the fire, they decided to become husband and wife. Fuxi and Nüwa used clay to create offsprings, and with the divine power they made the clay figures come to life. These clay figures were the earliest human beings. This myth has several variations, but the outline describes a great flood which destroyed all the humans all over the world except a pair of brother and sister, or aunt and nephew. Both were forced to be married in order to repopulate the world. One version stated that their children were ordinary humans, while the others said it was a lump of meat, gourd, melon, or grindstone; after they opened, cut, or destroyed it, humans emerged.